By default, all new games created by designers are private projects and are not available to the public. Designers can use our service to order as many copies of their game as they want and they are never required to publish a game to the online shop. However, if you do want to publish your game, then The Game Crafter wants to ensure that games created and ordered through this site are of high quality. As a final quality assurance check, you will be required to order a copy of your game as part of the publishing process. This will allow you to see the finished product before anyone else. You will not be charged full price; as always, you can purchase your own game(s) at cost. When you're ready to purchase your game, simply click on the "Add to Cart" button in the edit game screen. If there are any required fields or steps that you did not complete during the game editing process, you will be shown system messages alerting you of those items (for example, if you forgot to proof a card face or if you left the game's tagline blank in the Edit Details screen). If all items are complete, you will be directed to the address screen, where you will be asked to provide a shipping address, and if different, a billing address. You can then select a shipping method and complete your check out. Shortly after purchasing the first copy of your game, the system will recognize the sale, and then you'll have to wait 10 days before you’re allowed to publish your game. This policy ensures that designers have time to receive and review the physical copy of the game before they hit publish. Reviewing the physical copy is important to ensure that you and your customers are receiving a high quality product. You will want to begin promoting your game at this point, so others will find it and want to purchase it. 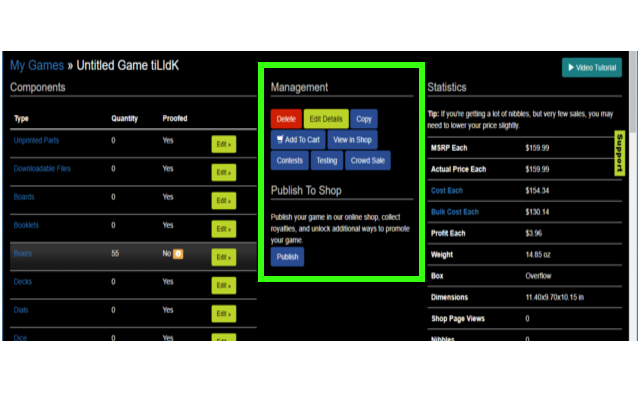 Visit the marketing section of this site to learn more about how to increase your game's visibility and drive sales. If you have additional questions about publishing your game, please click on the green "Support" button on the right-hand side of the screen on our site.